Description : Lado Bai works as an artist at the Adivasi Lok Kala Academy. She started painting on canvases at the same time as Bhuri Bai of Pitol. She has returned to painting after a long time, as financial constraints prevented her from pursuing her art. Through the years, she has received support and encouragement from the noted artist, J Swaminathan. Her job as an artist at the Adivasi Lok Kala Academy now allows Lado Bai to paint all the images she has been wanting to for so many years. 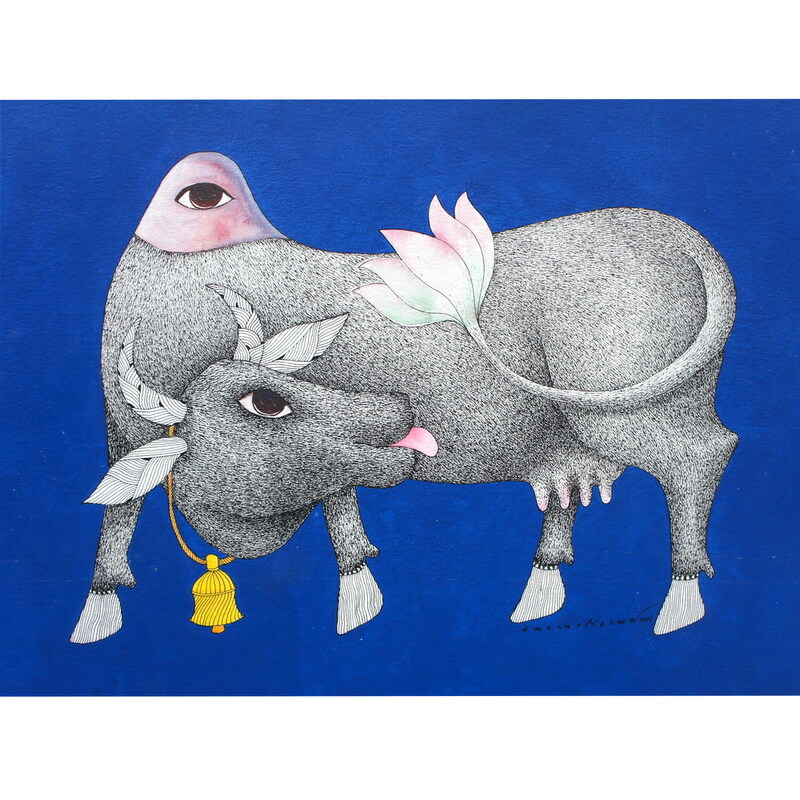 Lado Bai’s main motifs are the animal kingdom and Bhil rituals and festivals. Lado Bai can impress you by her mild smile and innocent way of talking. She reminisced, when J. Swaminathan brought her to Bharat Bhawan to work as an artist, Mrs. Indra Gandhi was invited for its formal inauguration, recognising her immense artistic talent she gifted her a cheque of twenty-five thousand rupees. Her naivety didn't understand its worth and thinking it a piece of paper she put it in a grain container. Later when people asked her about it, she realized it was something important but by that time it was feasted upon by the insects. Lado Bai is among such tribal artists who are keeping their traditional identity alive in their works and lives. 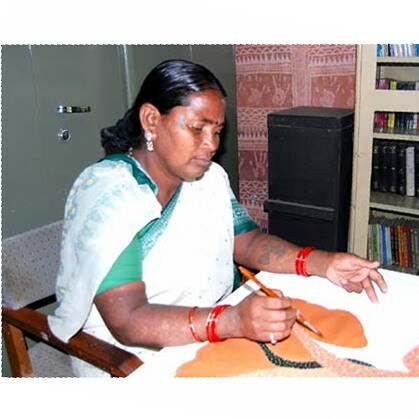 Her paintings reflect all the aspects of a Bhil life. She seems completely at ease while working with fine quality brush and canvas in place of a piece of jute which she would use before. 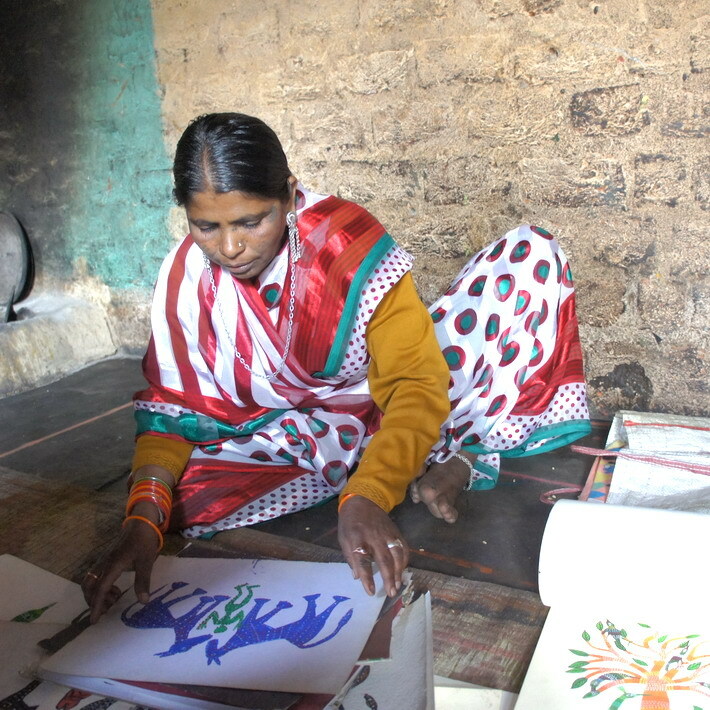 Today she is working at Adivasi Lok Kala Academy in Bhopal and is contented with her job as an artist.